The first deal of the festival goes to a selection from the Midnight Madness program. Greg McLean's The Belko Experiment debuted last night and today Deadline has reported that BH Tilt, the releasing company for Blumhouse Pictures, and Orion closed the deal on the pic. 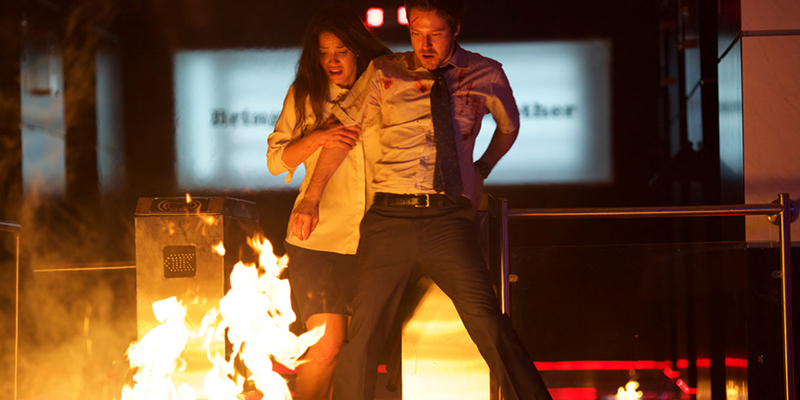 The Belko Experiment explores a twisted social experiment, in which a group of 80 Americans are locked in their high-rise corporate office in Bogata and ordered by an unknown voice on an intercom system to participate in a deadly game of kill, or else be killed. It stars 10 Cloverfield Lane‘s John Gallagher Jr., Scandal‘s Tony Goldwyn, True Detective‘s Adria Arjona, John C. McGinley, Silicon Valley‘s Josh Brener, Guardians of the Galaxy‘s Michael Rooker and Melonie Diaz, who co-starred in Fruitvale Station. I had read someone call the film a cross between High Rise and Battle Royale. If any of that is true then that is a combination worth looking into. The film was written and produced by James Gunn. I remember hearing McLean talking about this on Adam Green and Joe Lynch's podcast, although he was scarce on the details. Lynch was super-jealous because he was also up for the directing job and desperately wanted to do it. So hopefully the script was that good.